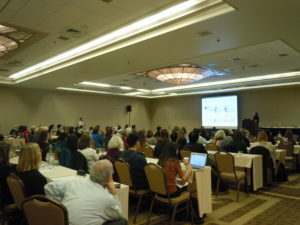 The 13th Annual BCERP Meeting – Understanding the Link between the Environment and Breast Cancer – took place on November 7-8, 2018. 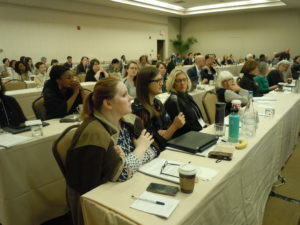 The meeting featured informative sessions on risk reduction of breast cancer, professional development seminars on environmental health research opportunities and training opportunities, a research poster session, and a community forum. This meeting was hosted by Georgetown University. The meeting was held at Georgetown University Hotel and Conference Center, 3800 Reservoir Road NW, Washington, DC, and the community forum was held at Thurgood Marshall Academy at 2427 MLK Jr. Ave. SE, Washington, DC. Camile Castilho Fontelles, Georgetown University. Ancestral paternal obesity: systemic versus local effects on offspring mammary tissue development and tumorigenesis. Nur Zeinomar, Colombia University. Empowering youth in cancer risk reduction through education: preliminary findings. Shaoqi Fan, National Cancer Institute. Relationship of epithelial nuclear density with measures of terminal ductal lobular unit involution and mammographic density. Gregory Chang, City of Hope. Elucidating the effects of Polybrominated Diphenyl Ethers (PBDE) on mouse mammary glands through single-cell RNA. Vanesa De La Rosa, Silent Spring Institute. Mining high-throughput in vitro testing data to inform in vivo studies of BCERP chemicals. Honorable Mention: Yuan Chun Ding, City of Hope. Association of PBDEs and BPA and epigenome modulation in sera of women at the menopausal transition. 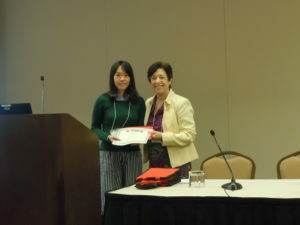 Honorable Mention: Raymond Lin, Great Neck Breast Cancer Coalition. To Replace Toxins Linked with Breast Cancer: Applications of Sophorolipid Butyl Ester in the Stabilization of O/W Emulsions for a Novel Food Packaging Material. Breast cancer is a complex disease with risk influenced by multiple genetic, environmental, hormonal, and behavioral factors. More effective approaches to prevent breast cancer will therefore require multiple scientific disciplines. Furthermore, any breast cancer research effort will be strengthened through active engagement with community partners. This annual BCERP conference incorporates the complementary perspectives of basic science, population science and community engagement. Research work has focused on specific windows of susceptibility in a woman’s life when environmental exposures may have greater impact on breast cancer risk. 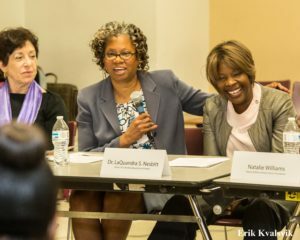 The community forum, supported by the NIH, was held in conjunction with the BCERP Annual Meeting and hosted by Dr. Linda Birnbaum, Director of NIEHS. The forum was held on November 8th, 2018 at the Turgood Marshall Academy Public Charter School at 2427 Martin Luther King, Jr. Avenue, SE, Washington, DC.